One of the great things about tofu is that it's a relatively blank canvas--just waiting to absorb inspiring flavors. 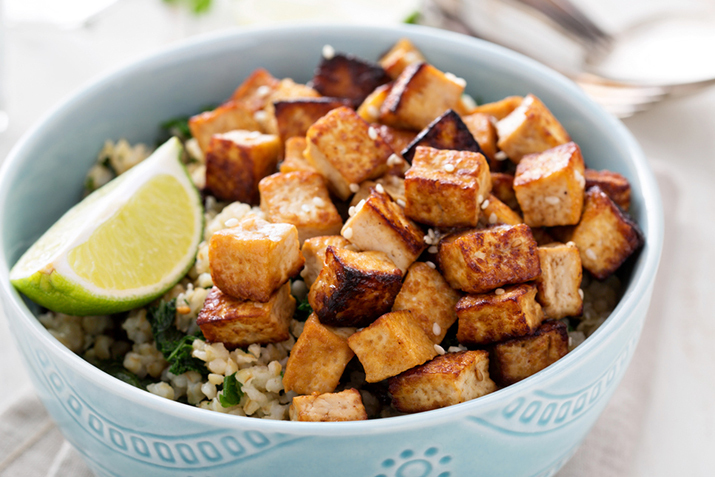 Ginger and other Asian flavors are infused into this delicious baked tofu. Pat the tofu rectangles dry with a paper towel, and place on a sheet pan with a rim. Brush the tofu with the sesame oil. Bake for 30 minutes, flipping each piece over after 15 minutes. Carefully drain most of the oil from the sheet pan. Mix together the ginger, garlic, tamari, Mirin and maple syrup, and pour it over the tofu. Bake for another 15 minutes until the tofu is firm and the sauce has reduced. Remove from heat and serve, drizzled with the sauce from the baking pan and garnished with fresh minced ginger, sesame seeds and scallions. Add this flavorful tofu to an Asian-inspired vegetable dish or serve it with cooked rice and a cup of miso or hot and sour soup.